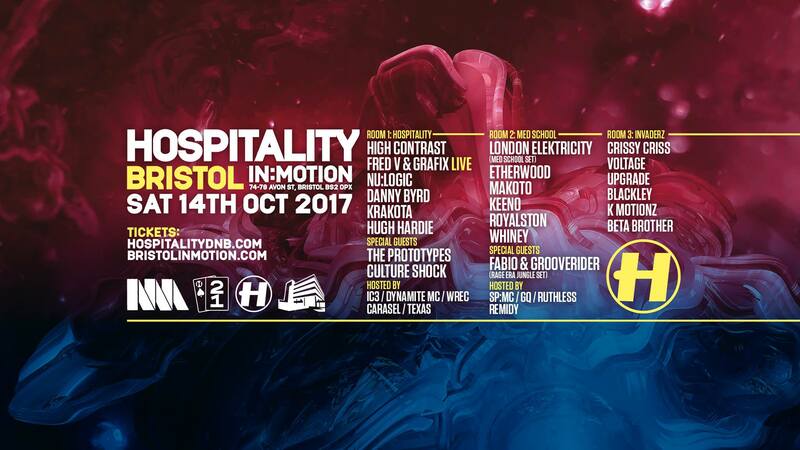 This Saturday (14th October) we were lucky to be at the world-famous Motion nightclub in Bristol, a venue that has once again been ranked among the top 20 clubs in the world according to DJ Mag. And over the weekend Motion played host to arguably the world’s most important drum and bass label- Hospital Records, who brought a stacked all-star lineup for its latest instalment of its famed Hospitality events. Included within the lineup, are some of the label’s biggest names, including High Contrast, who’s now in support of his latest studio album Night Gallery, Fred V & Grafix who’ll be trading DJ decks for guitars as part of an all-new live set, label-head London Elektricity heads up room two with a History of Med School performance, with further label support from the likes of Nu:Logic, Etherwood and Hugh Hardie. Hospital get some added help from The Protoypes, RAM’s Culture Shock, and the legendary Fabio & Grooverider. Despite such an extensive offering of drum and bass, the night undoubtedly belongs to Fred V & Grafix. Not often enough do successful drum and bass acts try their hand at live sets, and their 45 minute set was living proof of what an incredible experience live drum and bass is. Fronted with a guest vocalist, a guitar each, and with supporting vocals from Fred V himself, the performance was a diamond combination of explosive meeting ambient, with faultless instrumentation and inch-perfect production. A Forest Fires finale featuring Etherwood himself on vocals, was the perfect way to exit stage in style. Event headliner High Contrast ran into problems throughout his set, with all lights and sound failing for what felt like a good ten minutes, despite strong offerings either side of the complications, one that shone light on classic High Contrast hits, as well as from his latest full-length project. The Prototypes and London Elektricity’s room two set also stick out among the night’s many highlights. As is proving to be something of an expectancy, Motion know how to put on an event, and is still an unrivalled powerhouse of a venue. There was a mighty old queue on arrival, the main room was packed out throughout the whole night, and was noticeably hot once inside, but nothing comes close in terms of production values and atmosphere. Motion’s In:Motion series continues to be hosted throughout this Autumn and Winter, featuring sets from The Chemical Brothers, Chase & Status, Shy FX, and many more, tickets available at the Motion website.